Publisher's Summary:Life is fast, and I've found it's easy to confuse the miraculous for the mundane, so I'm slowing down, way down, in order to give my full presence to the extraordinary that infuses each moment and resides in every one of us. At 23, Andrew Forsthoefel headed out the back door of his home in Chadds Ford, Pennsylvania, with a backpack, an audio recorder, his copies of Whitman and Rilke, and a sign that read -Walking to Listen.- He had just graduated from Middlebury College and was ready to begin his adult life, but he didn't know how. So he decided to take a cross-country quest for guidance, one where everyone he met would be his guide. This was one of my "oh, that looks interesting" choices while sorting books at the library, and I started reading with a bit of skepticism, as well as curiosity about the stories he would listen to, and how much a kid fresh out of college could/would learn from it all. By the mid-point, the author had totally won me over. Forsthoefel does an excellent job of conveying who he was at each stage of the journey, with both a certain amount of self-deprecation and also a kindness toward himself that shows an unexpected maturity. And he truly does set out with a focus on others, listening to anyone who will talk to him. This leads to his first struggle: how to listen to people who say horrible, racist things. He never does wholly resolve that, though he reports the advice he gets as he asks others that question. I think the best advice he gets is to ask people, "what makes you think that?" As someone who is more interested in walking in the mountains, and reading accounts of the long trails, his choice to walk roads bothered me at first. Didn't he know that would be terribly hard on his body, and he'd have to look at a lot of ugly places? Eventually, I figured out that he may not have known all of that, but he was okay with it, because (unlike me) he wanted to walk where the people were. It's a different kind of thing. As the walk stretches on and Forsthoefel reaches the West (in high summer, about the worst possible timing for crossing Arizona, Nevada, and Death Valley), the author starts to develop a new understanding of what he is doing. That includes a suspicion that he is, at least in part, hoping that someone will give him the answers. Answers to what? To everything, including who he is and what he is doing. Before he is done, he has learned that no one else can tell him that, though there's no denying he got a lot of wisdom (and a certain amount of BS) from the people he listened to all across the country. 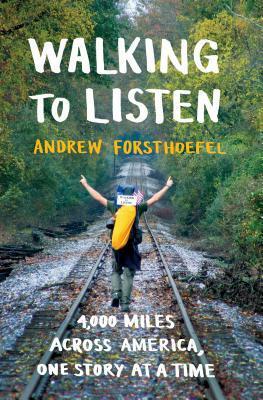 In spite of the book's length, I realized when he lists the people who traveled often long distances to be at the finish with him, this narrative only scratches the surface of what went on during the months of his walk. But it's a darn good start, and reflects a maturity and wisdom beyond his years--and they are well earned by walking. If you like to read about people who do interesting things, this is for you. If you read (as I did), Peter Jenkins' A Walk Across America, you might want to read this to see how the walk works some 40 years later. And if you are looking for a little reassurance that there are good people out there, this is for you as well. FTC Disclosure: I checked Walking to Listen out of my library, and received nothing from the writer or publisher for my honest review. The opinions expressed are my own and those of no one else. I am disclosing this in accordance with the Federal Trade Commission's 16 CFR, Part 255: "Guides Concerning the Use of Endorsements and Testimonials in Advertising." Advice on listening to people with "horrible racist views" is much needed at this moment in my community. I'll have to see if they have this one in my library. He certainly doesn't find "the" answer, but his reflections on it are worthwhile. Trying to find the way to neither appear to support/approve the comments nor totally shut down all hope of communication is a huge challenge.